Suppliers are apparently refusing to release fuel to Zimbabwe until the government settles what it owes to them, the Daily News was told yesterday. This comes as the prices of fuel are going down elsewhere in the region, while Zimbabweans have to contend with more anxiety and snaking queues at garages - as the government battles to pay suppliers. It also comes as under-fire authorities announced on Friday that they had released an emergency $60 million for the procurement of fuel, as product shortages continue to cripple commerce and industry, agriculture, transporters and private motorists. In addition, commuters have been left stranded and angry across the country, as they increasingly spend an inordinate amount of time waiting for transport - with those who are lucky to get lifts having to put up with sharply hiked fares. 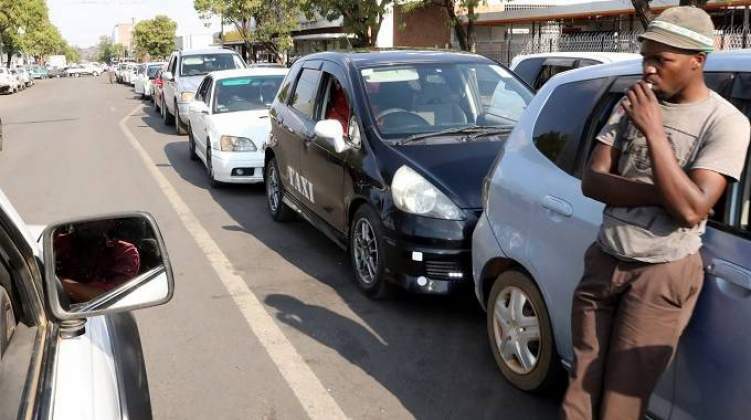 A Daily News team which went around Harare yesterday to assess the situation was met by desperate and frustrated motorists in serpentine queues at garages - similar to those witnessed during the horror 2008 hyper-inflationary era. And of the big four local fuel companies - Puma, Engen, Total and Zuva - only Total appeared to have significant supplies. On average, Zimbabwe uses about four million litres of fuel a day, amid claims by the government that the commodity shortages are due to cheap local product prices and an allegedly expanding economy. "Fuel consumption is doubling in the country. Those in the know explain the aspect in two forms - the expansion of the economy and comparatively cheap fuel prices which make one seek to drive to work rather than use public transport," President Emmerson Mnangagwa's spokesperson, George Charamba, told the Daily News yesterday. However, sources in the petroleum industry pooh-poohed the claims, saying the government was struggling to pay for supplies due to the prevailing and crippling shortage of foreign currency in the country. "Government is in arrears on its payments, and so suppliers are refusing to release the fuel until it has settled what it owes. "What is disappointing is that when government made a deal with one of the fuel companies here, authorities appeared to have relaxed - delaying paying suppliers in the process," one of the sources said. "You can't gamble with fuel … the fact is that payments should be made in advance. With all that is happening, we are likely to see even longer queues before things stabilise. "The problem is also worsening at a wrong time as demand tends to peak at this time of the year. We are hoping that Zim will have the requisite stocks soon for both the festive season and normal use," the source added. This comes as the government increased prices of fuel at the weekend, following the recent policy announcement by Finance minister Mthuli Ncube. Presenting his maiden budget, Ncube raised excise duty on petrol and diesel by up to 7 cents per litre, to reduce arbitrage opportunities by foreigners taking advantage of local currency disparities. "The country's fuel has become relatively cheaper compared to prices obtaining in the region. The increase in consumption is clearly unsustainable, considering that the available foreign currency reserves have to be shared among other critical priorities," he said. Meanwhile, Information deputy minister Energy Mutodi told the Daily News yesterday that the government was expecting fuel supplies to improve "soon". "The fuel supply situation has been affected by some delays in the disbursement of foreign currency in recent days. However, the ministry of Finance and the Reserve Bank of Zimbabwe are working on it and we expect things to return to normalcy soon. "We are also worried that some fuel suppliers may be heavily indebted, and thus cannot get fuel for resale even when the commodity is available at depots," he said. Meanwhile too, South African motorists will enjoy a hefty drop in the price of fuel as from Wednesday. "Gauteng motorists will be paying R1,84 less for both 93 and 95 octane petrol per litre from Wednesday. "The Energy department said the price of diesel would drop by R1,45 and R1,47 respectively and paraffin by R1,78. LP gas will drop by R2,43 p/kg," the Sunday Times of South Africa reported yesterday.